"We got the product together, but we just need a few bucks. We're in great shape, but we're about to go out of business." I don't think it's either ideologically loaded or inaccurate to say that over the last years, political talk radio has been the almost exclusively the province of conservatism. There's no Rush Limbaugh of the left, no blanket of liberal radio hosts to rival the army that includes Gordon Liddy, Sean Hannity and Michael Savage. (No doubt their rejoinder would be that the ever-reliable conservative bugaboo, the mainstream media, is hopelessly liberal, but that's a debate for another day, or another DVD review.) 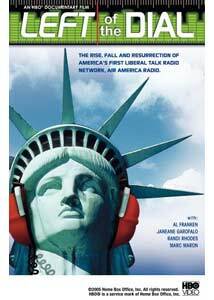 In early 2004, Air America sought to stem the tide, to push the political balance of this populist medium a bit closer to the center, and this documentary is a look at the first rocky year of the progressive radio network's existence. Politics aside, it's essentially the story of a startup, and the unexpected setbacks and obstacles that come with the beginning of any new business�then again, if the folks at Air America did in fact put politics aside, they wouldn't have much of a reason for going on the air. It certainly seems as if the new network was operating with a mish mash of a business model. Their on-air talent was a mixture of politically outspoken comedians like Al Franken and Janeane Garofalo, and radio pros who floated under the national radar, like Mark Riley and Randi Rhodes. And at times, in this behind-the-scenes look, it sure does look like amateur hour�hey, kids, let's put on a radio network! Franken is in many respects the linchpin of the operation; his books taking on the likes of Limbaugh and Fox News established the notion that there's a liberal audience out there, desperate for their politics to be given voice. Perhaps it's because he gave only limited access to the film crew, but Franken certainly doesn't come across as the biggest diva�Mark Maron is candid about his ignorance of the radio business ("I don't know how this works"); Chuck D has his point of view but seems insanely overextended; Liz Winstead can crack wise with the best of them, but that's not the same thing as getting it together for three hours of broadcasting every Monday through Friday. One of the unstated premises of the film is that though Franken gets all the glory, it's Randi Rhodes who's the heart and soul of the operation, the unsung hero of Air America. I've listened to Rhodes' show, though, and would have to disagree�she's full of self-pity and self-promotion in this film, and her shrillness is matched only by her solipsism. Her first guest on her first show was Ralph Nader, but she doesn't want to interview him; she only wants to tell him how angry she is, and he makes the perfectly logical choice to hang up on her. (Randi, you're just not our self-appointed Howard Beale.) I agree with a lot of her politics, but cannot take the I, I, I, me, me, me of her show, and I don't think I'm alone in this. But her self-involvement pales in comparison to the real villain of the piece, Evan Cohen, the first chairman and principal investor in Air America. It's soon clear that Cohen is incompetent, and there's even the suggestion that he's been doing things more nefarious: thanks to his financial mismanagement, the network bounces checks to its Chicago and Los Angeles affiliates, and after a couple of weeks is off the air in those two huge markets. And if you were an employee, it gets worse: he failed to pay the company's insurance premiums, leading to their coverage being dropped. So the film becomes about the financial dealings of the fledgling network: reassuring initial investors while seeking out new ones, making the necessary leadership changes to ensure that this isn't just a flash in the pan. The early triumph of the network, certainly, would have been the election of John Kerry, just eight months after startup, and the long faces and bristling denial on Election Night is brutal to watch, tempered only modestly by a new resolve the next morning to keep fighting the good fight. If you listen to the network, watching this can make you feel nostalgic about the subsequent departures of many who are seen here�Winstead, Maron, Katherine Lanpher�and make you wonder about the seriousness of a political media operation that has Jerry Springer as one of its principal faces. But the simple fact that Air America is still a going concern, even if it hasn't leveled the playing field, is one of the most promising pieces of news that the media has had to report since the days of hanging chads and Bush v. Gore. Image Transfer Review: A decent transfer, though the footage doesn't seem to have been shot on especially high-quality stock, no doubt for budgetary reasons; I'm sure that the Air America folks would understand all about that. Audio Transfer Review: A good amount of static, but no more than is typical for this sort of documentary. Extras Review: The on-air talent takes the microphone for the first commentary track: it's Randi Rhodes and Marc Maron, the latter of whom has since left Air America's airwaves. It's a jokey track full of rumor mongering and thinly veiled jealousy regarding Al Franken, but they both seem candid, which is refreshing. Also, Maron practically spews bile when the subject is Sue Ellicott, briefly his Morning Sedition co-host. Filmmakers Patrick Farrelly and Kate O'Callaghan are on the second track�their lilting Irish brogues make this a pleasurable listen, though it's principally going over complications of the shoot, the stuff you'd be pretty well able to deduce from the documentary itself. The track also includes a well-deserved ode to HBO documentary goddess Sheila Nevins. Nine deleted scenes are a random assortment, including Maron doing standup, some bonus time with Tim Robbins and with Carmine Garofalo, Janeane's father and a rock-rib conservative, and more footage of icky Eric Cohen. Janet Maslin of the New York Times moderates a post-screening discussion (21m:51s) with Farrelly, O'Callaghan, and editors David Zieff and Maeve O'Boyle; former Air America CEO Doug Kreeger, one of the good guys, joins them as well. The quality of the audio recording is so abysmal, however, that this is downright painful to listen to, and should be attempted only as an act of punishment. A candid look at the rocky start, both on and off the air, for the startup of Air America. Dittoheads, you have nothing to lose but your chains.